Boaters use many products to clean and maintain their boats. Many cleaning and maintenance products are considered hazardous waste such as antifreeze, lead-acid batteries, used oil and oil filters, oil/fuel saturated absorbents, solvents, paints, zincs, varnishes and cleaning products. The use of these products can sometimes result in spills and leftover products that require disposal. Hazardous wastes are toxic to human health and marine life and should be disposed of at a hazardous waste disposal facility. 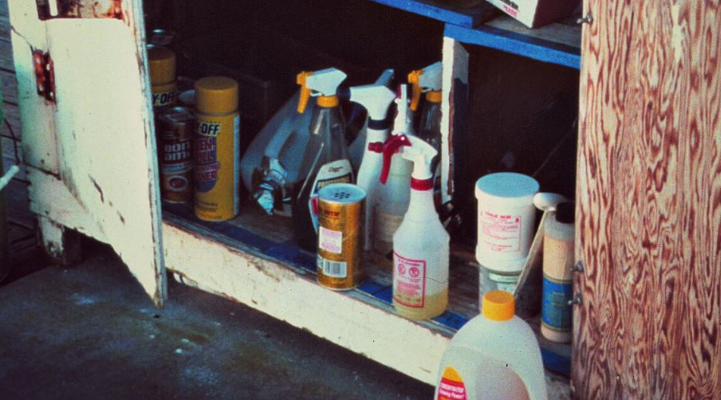 HOW CAN I PROPERLY DISPOSE OF HAZARDOUS WASTES? To find the hazardous waste disposal facility nearest you or your boat, check with your marina and/or call (800) CLEANUP, visit Cal Recycle. Or CLICK HERE to find your County Household Hazardous waste collection center . Keep recyclable hazardous waste segregated from other waste and take it to a hazardous waste disposal facility to be recycled. Recyclable hazardous waste includes lead-acid batteries (many retailers will accept your old battery for recycling), used oil, oil filters, antifreeze, and zinc anodes. The total amount of household hazardous waste transported by an individual to a household hazardous waste collection facility shall not exceed a total liquid volume of five gallons or a total dry weight of 50 pounds. If the hazardous waste transported is both liquid and non- liquid, the total amount transported shall not exceed a combined weight of 50 pounds (Health and Safety Code – Sub section b, Section 25218.5.1). The total combined volume or weight of latex paint, used oil filters, antifreeze, and small batteries transported to a recycle-only household hazardous waste collection facility by any one individual shall not exceed a total volume of 10 gallons or a total dry weight of 100 pounds. Up to two spent lead-acid batteries may be transported at the same time and not more than 20 gallons of used oil may be transported in the same vehicle if the volume of each individual container does not exceed five gallons (Health and Safety Code – Subsection c, Section 25218.5.1). A public agency may elect to increase the liquid volume and dry weight specified in paragraph (1) of subdivision (b) of, and in subdivision (c) of, Section 25218.5, to a liquid volume of 15 gallons and a dry weight of 125 pounds, if the public agency, as the case may be, finds that the local household hazardous waste collection program operated by that public agency, or its contractor, has adequate public education programs to inform the public on proper techniques for packaging and transporting the household hazardous waste to the program's household hazardous waste collection facilities (Health and Safety Code – Section 25218.5.5). Review storage of products every six months and properly dispose of old or unnecessary products. Lead-acid batteries: retailers take the old battery for disposal when you purchase a new one. Ask whether your marina will accept old batteries for proper disposal. If your marina doesn’t collect old batteries for disposal, call 1-800-CLEANUP or visit www.Earth911.com to find out where to dispose of them. Antifreeze: ask your marina or local hazardous waste disposal facility to recycle used anti-freeze. For more information on where to find an antifreeze recycling location near you go to: www.Earth911.com. Transmission fluid: ask the oil recycling facility that you use if it can be mixed with used oil for recycling. Zincs: take old zinc anodes to a scrap metal recycler. Some will pay for your old zinc anodes. Freon: Venting Freon into the atmosphere is illegal. Only certified technicians can purchase Freon, service units and handle Freon. Flares: Special care should be considered when disposing of expired flares. Please check the following list of Household Hazardous Waste Recycling Centers currently accepting expired flares. Do not set off aerials or hand-held flares for fun or just to get rid of them when expired. They can be seen and mistaken for a distress call. Do not discard them in the water. Remember -- According to Coast Guard regulations the shelf life for pyrotechnic devices is three years from manufacture. Just because the flares are expired doesn't mean they don't work, and if a real emergency occurs, one may need more than three flares. For disposal of expired marine flares, please contact the California Department of Toxic Substances Control (800-728-6942) or your local Certified Unified Program Agency for assistance. In Florida in 1999, a small child found an old flare in the back seat of a car, set it off and injured all six people in the vehicle. Florida boaters alone generate over 400,000 expired flares annually, according to state officials. Flares are explosives and pose certain hazards. Marine flares that end up in landfills or washed up on shorelines can cause injuries, and improper storage may result in fires. Nova Scotia: In 2007, a residential fire, resulting in over $75,000 in estimated damage was caused by an old flare. Report ALL spills of oil and chemicals immediately to the National Response Center (800) 424-8802, California Office of Emergency Services (800) OILS911, and to the marina office. Learn more about environmental laws associated with hazardous waste.